This past weekend was a busy one in the news, to say the least. Friday, it was announced that Senator John McCain would discontinue treatment for his brain cancer. 24 hours later, he passed away. Around this same time Saturday, news broke that Pope Francis may have known of accusations against one of his closest confidants, former Washington D.C. archbishop Cardinal Theodore McCarrick, who resigned this summer after it was discovered that he may have sexually abused a minor some 50 years ago. Then, yesterday afternoon, a gunman opened fire in a Jacksonville, Florida bar during a Madden 19 video game tournament, killing three and wounding eleven. After a weekend like this one, it is easy to be left reeling and restive. When cancer takes the life of an American hero, when a spiritual leader is accused of covering for sexual abuse, and when another – yes, another – mass shooting unfolds on another soft target, it can be extremely difficult to take everything in, much less to make sense of much or any of it. So, how do we process any of this? During relatively peaceful times, which seem fewer and farther between these days, we can be lured into a false sense of security. We can be tricked into forgetting that, in the words of God to Cain, “sin is crouching at the door” (Genesis 4:7) and it can rear its head at any moment. However, during tumultuous times, which seem to have become all too common, we can become drawn into alarmism and catastrophism. We can have a false sense that, in the words of Chicken Little, “the sky is falling.” Both senses are false. Generally, things are never quite as bad or quite as good as we think they are. The message of Christ can provide us with a reality check after a weekend like this one. Jesus has no problem warning the world of the full damage and devastation that human sinfulness can wreak. Jesus warns that, in this age, there will be an “increase of wickedness, and the love of most will grow cold” (Matthew 24:12). But Jesus also is clear that He has come to overcome sin. In the words of Jesus’ dear friend John, Jesus is “the light shines in the darkness, and the darkness has not overcome it” (John 1:5). Sin will not ultimately get its way. Christians can respond to the tragedies of our world with both a sober realism and an indefatigable hope. The death of a man as well regarded and as widely celebrated as John McCain can serve as a reminder of the brokenness of our political system and the often illogical rancor that eats away at any generative discourse. The promise of the man Jesus Christ is that He has come to bring peace between divided peoples and parties. The alleged secrecy of a man like Pope Francis in the face of a terrible crime like the one allegedly committed by Theodore McCarrick reminds us that sin runs for cover so it can continue its damaging and damning work. The promise of the man Jesus Christ is that He has come not only to reveal sin, but to heal those ravaged by it. The murderous intentions of a man like Jacksonville’s mass shooter is a reminder that death comes for everyone – sometimes at the times we least expect it. The promise of the man Jesus Christ is that by His death, He has conquered death. Every tragedy yearns for a Savior. Christianity promises that every tragedy has a Savior. And after a weekend like this one, that’s what we need to know most – and believe deeply. This year was one unlike any other for the Willow Creek Association’s Global Leadership Summit, which was held last week. The annual event, which began in 1995 at Willow Creek Community Church in South Barrington, Illinois, has drawn some of the biggest names in the world as its speakers – from U2’s Bono to President Bill Clinton to Prime Minister Tony Blair. The Summit is broadcast all over the world, including at over 600 locations in the U.S. alone. 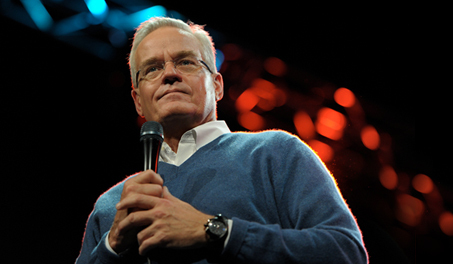 But when the Chicago Tribune published an expose last March accusing the Summit’s founder and former Senior Pastor at Willow Creek, Bill Hybels, of making sexually inappropriate advances toward multiple women over a period of decades, the event found itself facing an unprecedented crisis. Over 100 congregations withdrew as satellite host sites. Speakers who were scheduled to teach at the Summit, including Denzel Washington, cancelled their appearances. …church’s official response, and its ongoing approach to these painful issues. After many frank conversations with our elders, it became clear that there is a fundamental difference in judgment between what I believe is necessary for Willow Creek to move in a positive direction, and what they think is best. This past Wednesday, the congregation’s other lead pastor, Heather Larson, along with the elder board, resigned their positions after apologizing for not more sensitively and thoroughly addressing and investigating the accusations leveled against Mr. Hybels. A church that was once the gold standard for leadership, witness, teaching, and worship has been laid low in a matter of months. As I have written before, Willow Creek has had a formative influence on me in my ministry. I am thankful for all the congregation has given the worldwide Church. Unfortunately, it is now offering the Church a lesson it certainly never planned or wanted to – a first-hand warning of what happens when hypocrisy and secrecy overtakes integrity and transparency. The results speak for themselves. Several years ago, Bill Hybels wrote a book titled, Who You Are When No One’s Looking. In it, he extolled the value of character, which he defined as “what we do when no one is looking.” Character is being the same person in private as you present yourself to be in public. He was right in what he wrote. It appears he was very wrong in how he lived. And now, not only are he and his legacy left in tatters, the church and Summit he founded, the staff he led, and the family who thought they knew him are paying an inestimably steep price. Lapses in integrity never affect only the perpetrator. Because we are all sinful, none of us live with full integrity. We are all, to one extent or another, hypocrites. The best way to deal with inevitable lapses in integrity is to tell the truth about them fully and immediately. Sin is killed by confession. Unfortunately, our reflex is not to confess our sin, but to cover it up. When Adam and Eve committed history’s first sin by eating fruit from a tree of which God had commanded they should not, Genesis 3:8 says, “They hid from the LORD.” Adam and Eve thought it would be better to keep the secret of their sin than to tell the truth about their sin. They were wrong – a fact to which all of history is still testifying as we endure the effects of their first sin and cover-up. Secrets, especially when they cover shameful realities, can be awfully easy to keep. And the truth, when it is embarrassing and damaging, can be awfully hard to tell. But secrets come with a steep price, as Willow Creek is painfully learning. The truth, however, even when it is tough to tell, comes with a blessed return of freedom. Which, in the long run, do you think is better? Sadly, this crisis, half a world away, has been regularly eclipsed by a steady stream of riveting domestic intrigue. But the cries of these victims of war deserve our listening ears and concerned hearts. If the Lord hears the cries of the downtrodden, we should too. So please join me in lending your prayers to the cries of the Yemenis, asking God to bring this crisis to an end. Pray also that famine and disease would not overtake this land. In a world where our news cycles regularly revolve around the powerful, it can be all too easy to forget about those on the margins of our societies. The gospel, however, reminds us that we worship a God who marginalized Himself by being born into a poor village called Bethlehem and growing up as a poor carpenter from Nazareth only to become a poor rabbi who was executed by His enemies on a cross. Jesus lived His life as a marginalized man. This man on the margins, however, has promised to use His very marginalization on the cross to draw all people to Himself (cf. John 12:32). This man on the margins has turned out to be nothing less than the very center of history. Jesus’ method of marginalization should most certainly inform our mission of reaching and loving the world for Him and in Him. So, let’s keep our peripheral vision peeled to see those others miss and love those our world overlooks. For this is what Jesus has done with us.